This was our boy’s observation as we pulled into the drive thru at McDonald’s yesterday. The fast food Mecca is the bane and savior of many an autism parent’s existence. I wish I could say that I took him there only because after 7 weeks of camp he deserved the french fries, but the fact is that after 7 weeks of him at camp plus a college drop-off I craved the Big Mac even more than he did the fries. I knew we would both be sorry in a few hours but we had both been on our best behavior for so long it seemed a minor transgression. And the phrasing of his remark may not be grammatically correct, but it sums up perfectly the mixed feelings those of us who still go the McDonald’s (oh, come on, you know who you are) have about it – that smell and the very act of pulling up to the window are a sensory memory none of us ever forget. 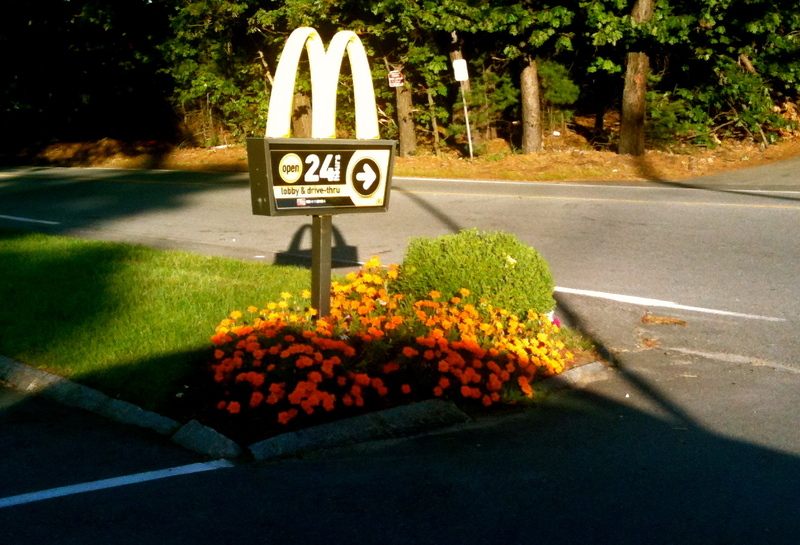 If you have not heard Jim Gaffigan‘s riff on McDonald’s, you owe it yourself to go here. So, contraband procured, our boy clutched the bag and said, “Shall we wait until we get home?” and then immediately began to eat them – longest ones first. My favorite part (other than the Big Mac) was, as I watched him munch out of the corner of my eye, I asked him to share a fry with me – and, as usual, he gave me the shortest one he could find.